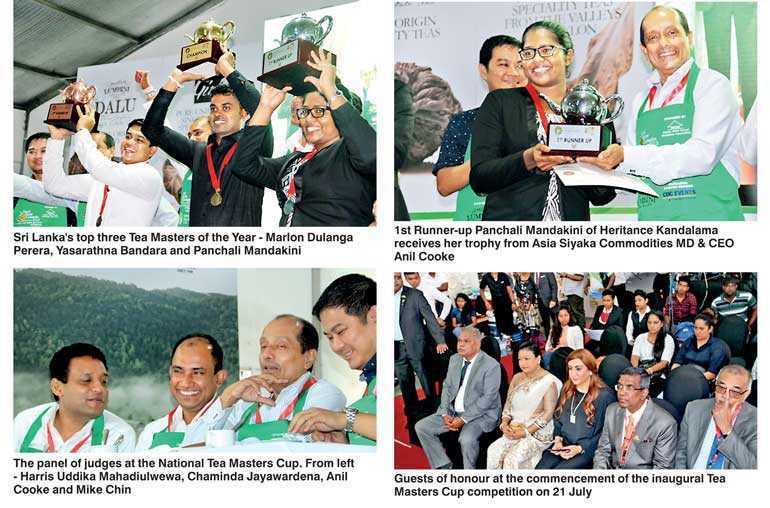 Yasarathna Bandara of Habarana Village by Cinnamon was adjudged the Tea Master for the year 2018 at the first ever Ceylon Tea Masters Cup organised by the Ceylon Hotel School Graduates Association, in partnership with Lumbini Tea Valley and Buds & Beans. Heritance Kandalama was placed second with 386.5 points, while Pegasus Reef Hotel’s Marlon Dulanga Perera was third with 371.5 points. 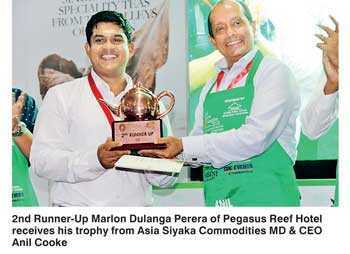 The Ceylon Tea Masters Cup was held as part of the 13th edition of the Hotel Show Colombo, organised by the Ceylon Hotel School Graduates Association. 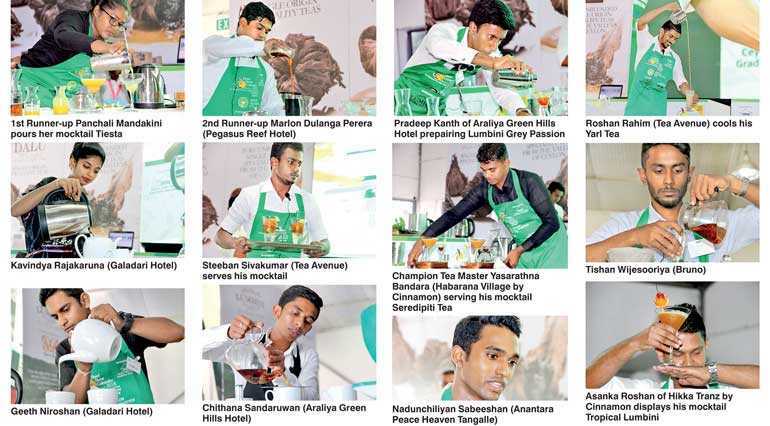 The first ever Ceylon Tea Masters Cup championship was held at the BMICH on 21 July, and 12 finalists were selected after the preliminary rounds held last week from over 40 applicants. 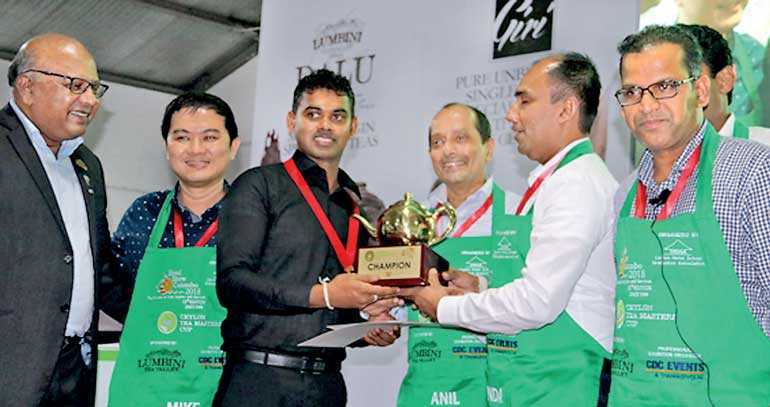 “Even though Ceylon Tea celebrated its 150th anniversary last year this is the first time that a competition is being held for those who brew and serve the magical leaf,” said event co-sponsors Lumbini Tea Valley Managing Director Chaminda Jayawardena, together with Buds & Beans, Lumbini’s restaurant chain serving Ceylon specialty Tea and Coffee. The Tea Masters Cup was judged in two categories, namely, the Tea Preparation Championship, and the Tea Mixology Championship. In the Tea Preparation Championship, the Tea Master (competitor) was expected to demonstrate the skill of tea preparation, by brewing and presenting two beverages either hot or cold, in a timeframe of 10 minutes. The contestant was given the choice of selecting an unflavoured tea of his/her choice from the Lumbini and Giri range of teas, which included the award-winning Sinharaja Wiry Tips, Manjary, Muguru, Ladaluchakkra, Keshari and the exclusive Lumbini Golden Tips and Silver Needles. The panel of judges, comprising of Asia Siyaka Commodities Managing Director and CEO Anil Cooke, d’Good Café Singapore Founder and Tea Master Mike Chin, Lumbini Tea Valley and Giri Tea Marketing Managing Director Chaminda Jayawardena, and Giri Tea Marketing Joint Managing Director Harris Uddika Mahadiulwewa, evaluated the aroma, taste, flavour, after-taste, brewing and serving techniques, as well as the presentation. In the Tea Mixology competition, the Tea Master was expected to demonstrate the skill of preparing and presenting two servings of a multi-ingredient tea-based beverage within a timeframe of ten minutes. 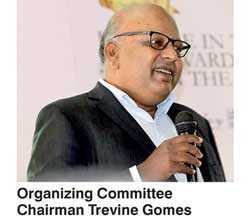 The contestants were permitted to select flavoured or unflavoured tea of their choice from the Lumbini and Giri range of tea, and any other ingredients permitted under the local laws. Champion Tea Master for 2018, Yasarathna Bandara, presented Serendipiti Tea, a beverage prepared with Lumbini FBOPF tea, lemongrass, jaggery, allspice leaves, and fresh mango, while 1st runner-up Panchali Mandakini presented Tiesta, made using Lumbini Tipsy Eve tea, fresh peach juice, passion fruit cordial and jaggery. 2nd runner-up Marlon Dulanga Perera presented Cinnamon-Ginger Lumbini Malt Iced Tea, made with Ceylon Malty Black Tea, Cinnamon and Ginger Sugar Syrup.